Larry J. Sabato's Crystal Ball » Could Johnson Voters Save the Republican Senate Majority? Could Johnson Voters Save the Republican Senate Majority? The watchword for congressional races in a presidential year is coattails, specifically in this election negative coattails from Donald Trump. In the Senate, a number of GOP incumbents are hoping they can run just far enough ahead of their presidential standard bearer to survive. But this is a perilous place to be. As we discussed back in 2015, only eight of 17 Republican incumbents have won reelection going back to 2000 in states where the Democratic presidential nominee carried the state. The median number of percentage points those Republicans ran ahead of the presidential ticket was 5.7 points in the two-party vote. And the smallest margin for a GOP incumbent running ahead and winning reelection was Sen. Dean Heller (R-NV) in 2012 when he ran 4.0 points ahead of Mitt Romney in the two-party vote. Obviously, the fact that a third-party candidate — Libertarian Gary Johnson — will be winning a decent share of the vote (probably at least 5% nationally) affects the two-party vote comparison a bit. Still, the data are helpful for understanding the state of play in this cycle versus recent elections. 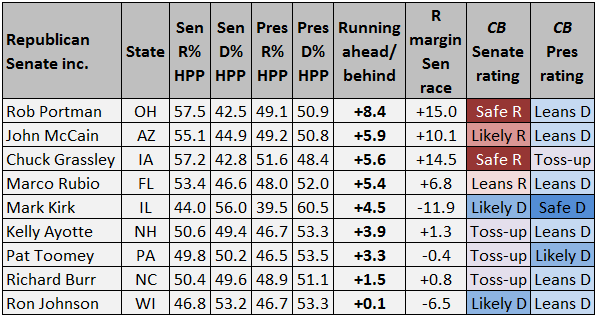 Tables 1 and 2 lay out the current HuffPost Pollster (Table 1) and RealClearPolitics (Table 2) Senate and presidential averages (in the two-party vote) in states that the Crystal Ball currently projects as at least a Toss-up or better for Clinton. As things stand, every GOP incumbent in these tables is running at least slightly ahead of Trump in the two-party vote. But note that seven are running behind the aforementioned 5.7-point median in the HuffPost Pollster aggregate and six in the RealClearPolitics average. The exceptions are Sens. John McCain (R-AZ) and Rob Portman (R-OH), both of whom look secure even if their states go blue in the presidential race. Sen. Chuck Grassley (R-IA) is in safe territory, but the other six who make the list in both tables are in some degree of danger. And at least two are below the “Heller Line” — if you will — of running 4.0 points ahead in the two-party vote in both averages, with two others also beneath it in the HuffPost Pollster trend. This group doesn’t include Sen. Roy Blunt (R-MO), who is locked in a tight race with Missouri Secretary of State Jason Kander (D), nor does it account for the Toss-up open-seat battle in Indiana between ex-Sen. Evan Bayh (D) and Rep. Todd Young (R). 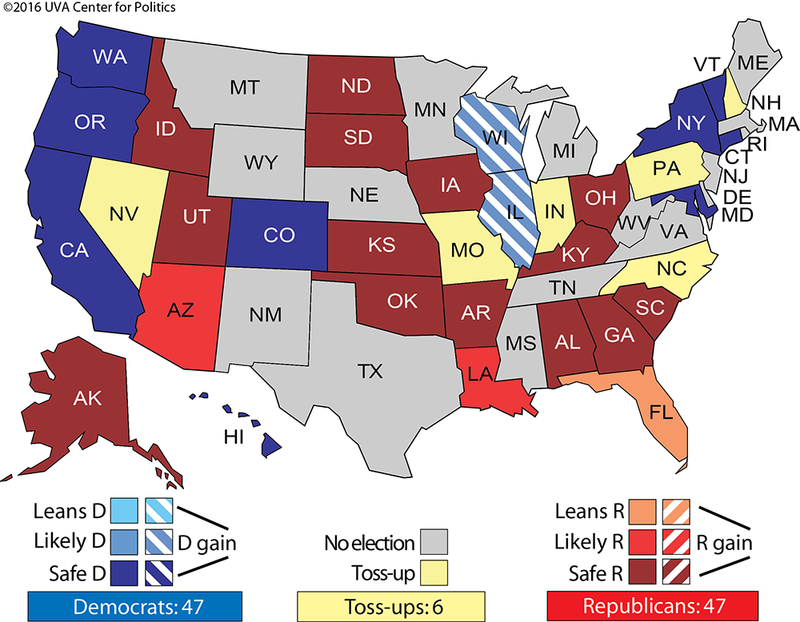 Democrats could achieve just a 50-50 tie in the Senate by capturing two of the three competitive Senate seats below the Heller mark in one or both averages (New Hampshire, North Carolina, and Pennsylvania), win the Likely Democratic races in Illinois and Wisconsin, and carry one of the two contests in Indiana and Missouri to win four net seats to reach a 50-50 tie. Granted, they have to hold onto Nevada in this scenario, another Toss-up contest and the only Democratic-held seat in danger in 2016. The point is, there are still a fair number of paths to Senate control for the Democrats. As Josh Kraushaar of National Journal reported earlier this week, GOP internal polling shows Republican Senate nominees barely ahead in Florida, Indiana, Missouri, New Hampshire, North Carolina, and Pennsylvania, and trailing narrowly in Nevada. It wouldn’t shock anyone if those seven contests split about evenly. So if Democrats won four of the seven, the additional gains in Illinois and Wisconsin would give Democrats a five-seat net gain and a 51-49 majority in the upper chamber. Considering the Democratic-friendly trajectory of the political environment, it could well be more — and even three of those seven might be sufficient to get them to a 50-50 tie, where a Vice President Tim Kaine could break ties in favor of the Democrats. Who could salvage this situation for Republicans? Gary Johnson voters to the rescue. Based on concurrent presidential and Senate polls taken in the past month, an average of about 4% of the overall electorates in the seven Toss-up and Leaning Senate races are independents who plan to vote for Johnson. (By comparison, nearly 1% are independent Jill Stein voters.) And just shy of 2% of these states’ electorates are Republicans who say they will vote for the Libertarian nominee. The national polls tell a similar story: A larger share of self-identified Republicans in national polls say they’ll back Johnson than self-identified Democrats (Stein voters are more Democratic-leaning, but much smaller in overall number). According to HuffPost Pollster, about 5% of Republicans say they are backing Johnson while 3% of Democrats say they do. Self-identified independents are the most likely voters to say they support Johnson (around 10% of them nationally). What these Johnson independents and Republicans decide to do in these Senate races will be pivotal. At the moment, independents are giving a boost to Republicans more so than to Democrats in these seven contests: On average, the GOP Senate candidates are running four points ahead of Trump among independent voters (in overall vote share, not two-party), who again are the most likely group to back Johnson. Notably, Sens. Kelly Ayotte (R-NH), Marco Rubio (R-FL), and Pat Toomey (R-PA) are all running at least eight points ahead of Trump among independent voters. The only Republicans actually running behind Trump among independents are Blunt and Young, which makes sense: For Democrats to have a chance in these typically red states, they need to have complete backing from their base and win over independents as well. 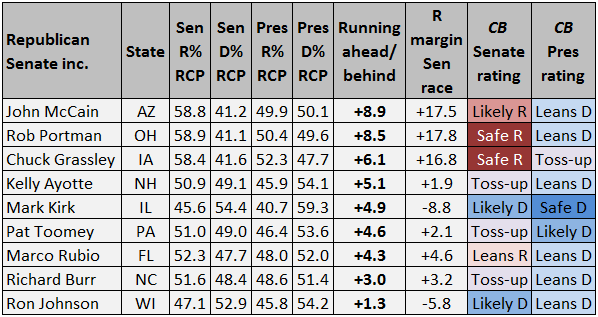 Note that the Republicans in these seven contests are also running an average of 1.5 points ahead of Trump among GOP voters; the difference may well be Republican Johnson voters. These voters may not like the Republican presidential nominee, but if they show up and vote Republican down the ticket, they may be able to save the GOP’s Senate majority. The only ratings change this week in the Senate is the Sunshine State battle, where Rubio is facing Rep. Patrick Murphy (D-FL). There are mixed signals in this race: Most recent surveys give Rubio a lead of five or fewer points and the presidential race continues to show positive signs for Clinton. But the Democratic Senatorial Campaign Committee has canceled its remaining TV ads in the Senate race. Coattails could still save Murphy, and a new Quinnipiac poll showing Rubio only up two points necessitates caution. Thus, we’re moving the race back to Leans Republican from Likely Republican. As we have previously pointed out, Rubio could win reelection in part because of his support among Cuban Americans in South Florida. The Quinnipiac poll found Rubio out-performing Trump among nonwhite voters — Clinton led Trump 73%-19% among these voters but Murphy only held a 63%-33% advantage. In 2014, Cuban Americans made up 31% of the voter-eligible Latino population in Florida, making them a significant force in a close election where many may vote for Clinton or someone else not named Trump, but still back Rubio. Nonetheless, if we see a surprise in the Senate on election night, it could come in Florida — even though Rubio is still the favorite.